Digi-Schlock: SQUIRM (Scream Factory Blu-Ray) – Schlockmania! If you collected genre flicks during the glory days of the DVD format, you probably remember MGM’s “Midnight Movies” line with fondness. This DVD line rescued a lot of American International Pictures titles from oblivion and restored them to celluloid-on-video glory, often throwing in a few extras. When Scream Factory tapped into the MGM catalog, they picked up the gauntlet that the Midnight Movies line had laid down. Squirm is an example of what Scream Factory does with an old Midnight Movies fave in the realm of high-def and the results are likely to please fans. The package begins with a nice-looking HD transfer: the film’s earthy color scheme is faithfully represented, the clarity is nice and the black levels are appropriately inky. You might notice a little black “crush” during the night scenes but otherwise this is a solid transfer. The stereo soundtrack mix is presented in a lossless 2.0 DTS format and sounds pretty good for a vintage mix, with clear dialogue and a nice presence for the analog synth-tinged musical score. Scream Factory includes a nice little complement of special features to accompany the main event. First up is a commentary track carried over from the MGM DVD, a solo affair featuring writer/director Jeff Lieberman. He has no problem filling the track on his own as he chastises MST3K for failing to understand the film’s satirical/playful side, discusses the motivations behind different plot choices and gives insight into the different actor’s styles and how he often rewrote during the shoot to incorporate their talents into the storyline. Elsewhere, he reveals which actors didn’t make it into the film (Kim Basinger, Sly Stallone and Martin Sheen!) and talks about the childhood memory that inspired the film’s plot. All in all, a consistently engaging track for the film’s fans. In the main extras section of the disc’s menu, there are two new featurettes. The first is a 33-minute piece entitled “Digging In” that incorporates interviews with Lieberman and star Don Scardino. Lieberman expands on some stories from his commentary and adds additional interesting details like how the film was originally set in New England until schedule issues forced a Georgia shoot and how cinematographer Joe Mangine helped up him stay on schedule while learning his directorial craft. He also doles out fun anecdotes about the “tree crash” and “room of worms” FX scenes plus an amazing tale about how the film almost ended up as a Columbia Pictures release. Scardino adds memories from an actor’s point of view and both men discuss how their instant rapport led to them working together to flesh out the character of Mick. Clips and ad mats are deftly woven in throughout the piece, giving it a nice visual energy to match the enthusiastic storytelling from Lieberman and Scardino. Next up is a quick set of promotional materials. A 2-minute theatrical trailer features great deadpan-creepy narration and expertly exploits the ick factor of the film’s worms. A one-minute t.v. spot offers a decent condensed version of the theatrical spot. A one-minute radio spot reuses the effective narration from the trailers and throws in the “worm scream” sound effect from the film for good measure. 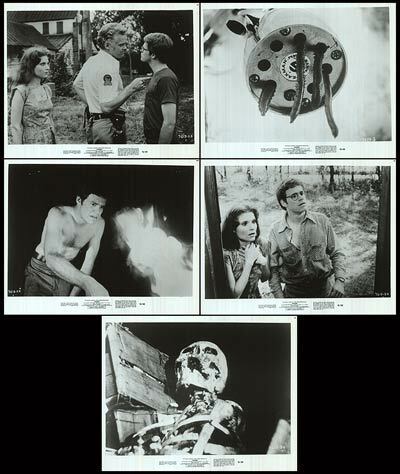 A still gallery rounds the promo extras out, dishing up 25 images that mix plentiful color and black-and-white stills with a few lobby cards and posters (including some interesting international designs). The final inclusion is a “more from Scream Factory” set of bonus trailers for Pumpkinhead, Motel Hell and The Beast Within. The rural terror theme to these spots makes them a nice complement to the main feature. In short, Scream Factory has done well by this old “Midnight Movies” favorite. If you love the movie, this disc provides a fun way to give Squirm the high-def bump. 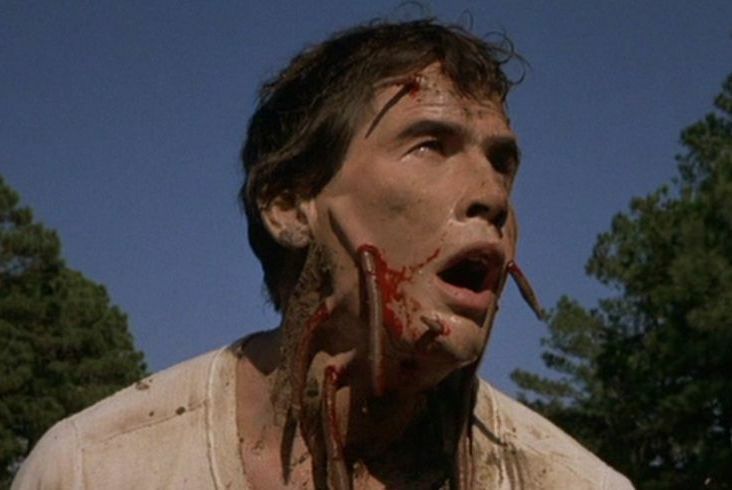 To read Schlockmania’s film review of Squirm, click here.